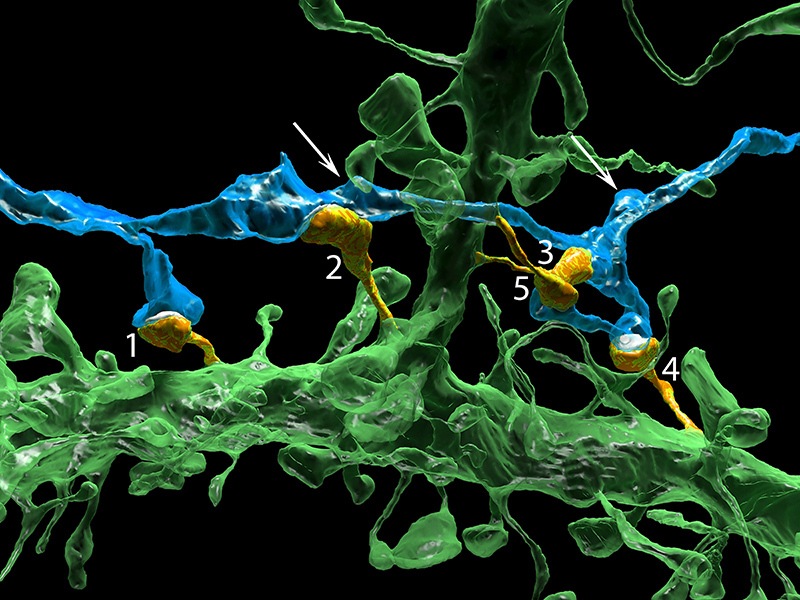 Researchers have developed single-cell imaging for the brain on the nanoscale. Around the turn of the 20th century, a Spanish neuroscientist named Santiago Ramón y Cajal created intricate images of intertwined neurons that changed neuroscience forever. His exquisite illustrations helped scientists understand some fundamental facts about the brain, namely that long-armed neurons, communicating over gaps called synapses, are the basic unit of the human nervous system. Now, a team of researchers from Boston University, Harvard and the Massachusetts Institute of Technology have developed a new system for imaging and analyzing neurons on a much finer scale, one they hope will produce insights into everything from developing brains to devastating mental disorders. The opensource study is published in the journal Cell. The researchers have begun the process of mining their imaging data by looking first at an area of the brain that receives sensory information from mouse whiskers, which help the animals orient themselves and are even more sensitive than human fingertips. The current study shows that the complexity of the brain is much more than imagined. The lab state that they had this clean idea of how there’s a really nice order to how neurons connect with each other, however, when they actually looked at the material it wasn’t the case. They go on to add that the work overturns a longstanding assumption, known as ‘Peter’s Rule,’ that if two neurons are close to each other, they are likely to form synapses that allow them to communicate. It seems logical, however the data findings show that it is false, at least in this particular part of mouse brain, a piece of cortex that receives sensory information from whiskers. The imaging system contains both hardware, which slices and photographs brain samples, and software that analyzes the data. The patented hardware is called ATUM, for automated tape collecting ultra-microtome. It uses a diamond knife to cut stained, plasticized samples of brain tissue into 30-nanomenter slices, then collects and photographs the samples with an electron microscope and stores the data. The scientists used a program called VAST to assign different colours and piece apart each individual ‘object’ (e.g., neuron, glial cell, blood vessel cell, etc.). The lab note that the cost and data storage demands for this research are still high, however the researchers expect expenses to drop over time, just as it has for genome sequencing. To facilitate data sharing, the scientists are partnering with Argonne National Laboratory and hoping to create a national brain laboratory that neuroscientists worldwide can access within the next few years. The researchers see great potential in the tool’s ability to answer questions about what a neurological disorder actually looks like in the brain, as well as what makes the human brain different from other animals and different between individuals. They go on to add that who a person’s identify is very much a product of the connections their neurons make in response to various life experiences. The team conclude that to be able to compare the physical neuron-to-neuron connections in an infant, a mathematical genius, and someone with schizophrenia would be a leap in the understanding of how the brain shapes the personality and disorder & vice versa.